The Alaska Department of Transportation & Public Facilities (DOT&PF) helped fishermen save time and money while also contributing to their safety by completing repairs on a vital bridge more than two weeks ahead of schedule. Repairs on the Williamsport to Pile Bay Road—Illiamna River Bridge #2137, a roughly $614,000 project, began May 5 after an overweight load (or multiple overweight loads) traveling the bridge weakened its carrying capacity to a level below what was needed to carry the typical loads that utilized the bridge. While the bridge desperately needed the repairs, Alaska transportation officials were also mindful that closing access to the bridge was troublesome to local fishermen who rely on the bridge as a vital route to the nearby Bristol Bay fishing grounds. The route that involved the Illiamna River Bridge helped the fishermen save time and money, while also providing safe passage through easier water. Their alternative route to the fishing grounds required the fishermen to take their boats around False Pass, where they encountered more turbulent water. Challenges in repairing the bridge presented themselves immediately. Deep snow drifts necessitated that DOT&PF clear the snow as it went along in the repair process. While DOT&PF took advantage of a high tide in order to have equipment and materials delivered via barge, other equipment had to be delivered via helicopter due to soft road conditions and other logistical challenge. 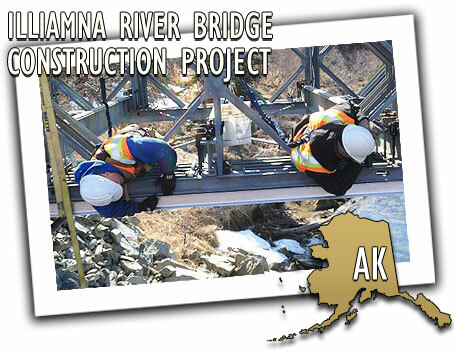 But by working closely with its contractor, Southwest Alaska Contractors, LLC of Anchorage, and offering an incentive for quick completion, DOT&PF was able to open the bridge on May 26, 15 days ahead of the projected June 10 reopening date. This quick execution by DOT&PF and its contractor allowed workers of Alaska's most lucrative business to get back to work and provide for their families.